And be sure to check in on Wordless Wednesday too! what a beautiful capture! I think they see you! Love this shot, the color is spectacular! u got it right when it is looking at u! The smear of the background is a nice contrast to the focus on the birds. It makes you look at the red coloring. Nice picture, and Happy WW! Thanks for putting a name to a bird that I see every spring. I wasn't sure of his name but think he is quite handsome! What a spectacular shot. Your photography is amazing! Candy, YOur bird photos for this post and your last one are fabulous! I love how you captured these little feathered friends so up clos and personal. Beautiful photography. It feels like I am looking at photos in national geographics! Wow! I don't think I have seen such a handsome finch! Wow-you are a great photographer. Beautiful photo! WONDERFUL SHOT OF THOSE LOVELY BIRDS. YOU DID AN EXCELLENT JOB ON CAPTURING THEM IN SUCH DETAIL. Love the "red head" in your photograph. Thanks so much for sharing with us on Rednesday. What a beautiful bird!!!! I would love a bird with some color!!!!!! I will have to share this photo with my bird loving cousin! 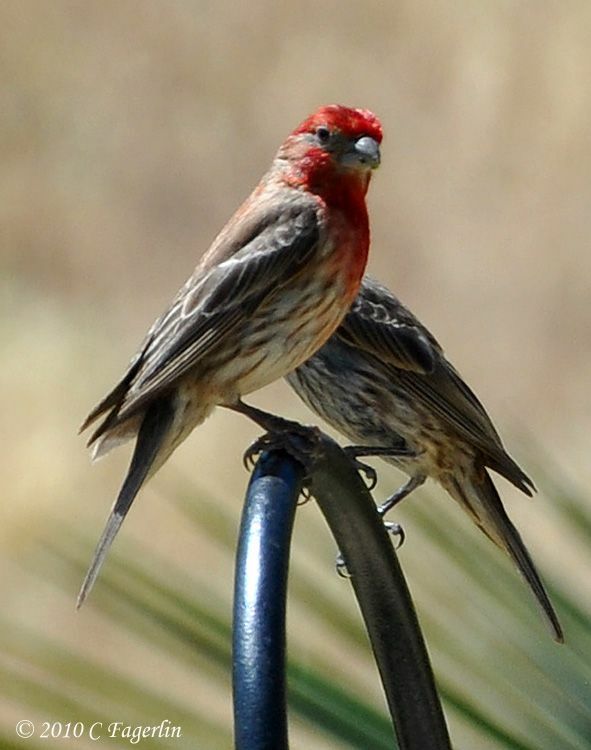 Great photo--we have a ton of these birds with their babies at our feeders right now!! Fantastic photos! The color is awesome! Love this photo, I can never get this type of photo. Would love to know what type of camera you took this with. He is a "poser" for sure ..... that's his favorite spot to keep track of goings on in the garden and sometimes I think he is actually looking for me through the kitchen window. :-) I call him "The Peacock" because he is a terribly vain little guy! NYC Mom - This was taken with a Nikon D90 with the basic kit lens. Most of the images from the last few months came out of the D90, but older images here on TLRT were taken with an older Nikon Coolpix. Thanks again for coming by, more birds by next week I hope!